The driver was killed along with 19 others in the crash in upstate New York. The family of the driver of the limousine that crashed in upstate New York, killing 20 people, believe the vehicle "was neither roadworthy or safe," the family's lawyers said. The driver, Scott Lisincchia, 53, died in the accident along with the 17 others inside the car and two pedestrians. Lisincchia's wife released a statement through her lawyers, which said that the Lisincchia family is "devastated by the horrific tragedy" and "prayers go out to all the families that lost loved ones." "They are mourning their husband, father and brother, and they are also grieving for the other innocent souls who lost their lives," the lawyers' statement reads. Scott Lisincchia is described in the statement as "a loving and caring man who never would have knowingly put others in harm's way." "The family believes that unbeknownst to him he was provided with a vehicle that was neither roadworthy nor safe for any of its occupants," the statement reads. The vehicle failed a Sept. 4 safety inspection in part due to an Anti-lock breaking system (ABS) malfunction indicators for the hydraulic brake system, according to records reviewed by ABC News. State transportation officials declined to immediately elaborate on the notation. Such a malfunction could mean that there is a problem either with the brake system or simply with the indicator light connected to said system. The record from the Sept. 4 inspection also notes that there is a violation for “failure to correct defects noted on previous inspection report," though it did not detail those prior failures. "The assertion that the limousine was cleared to be on the road following the September inspection is categorically false," according to a spokesperson for the New York State Department of Transportation. "The vehicle was subject to inspections and the owner was warned not to operate the vehicle; the vehicle was placed out of service." Richard Burke, a spokesperson for the Lisinicchia family, told ABC News that Lisinicchia had previously told his wife about issues with the company's vehicles. Burke said that Lisinicchia's wife "told me that he had complained to her regarding the condition of some of the vehicles. In fact they said that one time he was driving one of the vehicle’s and a muffler fell off with clients in the car and he had to stop the car, get out of the car, remove the muffler and move it to the side of the roadway." Burke said that Lisinicchia had worked as a driver of trucks, tractor trailers, and dump trucks. "He's a very safe driver. He never had any kind of accident like this," Burke said. Both state and federal authorities are investigating the crash, which is the deadliest transportation accident in the U.S. since August 2009, according to the chief of the National Transportation Safety Board. (Hans Pennink/AP) Family members and friends gather for a candlelight vigil memorial at Mohawk Valley Gateway Overlook Pedestrian Bridge in Amsterdam, N.Y., Oct. 8, 2018. The NTSB has been on the scene in the upstate New York town of Schoharie since Sunday, the day after the crash, and its investigation is underway. The safety of the vehicle is inevitably going to be a major part of the investigation, and New York Gov. Andrew Cuomo said Monday the limousine had failed a safety inspection with the state's Department of Motor Vehicles just a month prior to the crash. Additionally, law enforcement sources said the limo driver lacked the proper license to operate the vehicle and officials are looking to see if safety protocols were violated. The license that Lisincchia held, according to a state official, did not qualify him to drive more than 15 passengers. "One of the questions we're trying to help answer, very honestly, [is] any of those safety problems, could those have contributed to the crash? We want to make everybody know right now that we're doing everything we can to answer those questions, along with the state," Kindlon said. Family members of the victims said that the group was headed to a party in Cooperstown, about an hour west of Schoharie, when their stretch limousine flew past a stop sign and slammed into a parked SUV. The brewery that the group was headed to at the time of the crash released a statement confirming that they had a reservation for noon Saturday. "We were incredibly saddened to learn of this horrible tragedy," read a statement on the Facebook page for Ommegang, a brewery in Cooperstown. (Cindy Schultz/Reuters) A family member, who asked not to be identified, mourns during a candlelight vigil for the victims of a limousine accident in upstate New York, in Amsterdam, N.Y., Oct. 8, 2018. The autopsies of the victims have not yet been released, but New York State Police released the names and ages of the victims on Tuesday afternoon. All of the passengers were between 24 and 34 years old. The two male pedestrians were 46 and 70 years old, and Lisinicchia was 53. The agency's chief, Robert Sumwalt, said Monday that "some seats were equipped with lap shoulder belts," but he did not specify which. "At this point we're not sure if all seating positions were equipped with seatbelts," Sumwalt said, adding that it is also not clear whether anyone in the limousine wore safety belts. A New York State official said that state law requires seatbelts in the front seat of passenger vehicles, but given the size of this limousine it would be considered a bus. In that case, state law does not require seatbelts for passengers. The limo company, Prestige Limousine, agreed to take its fleet of cars off the road in the wake of the accident, according to a Monday statement. "Prestige Limousine extends its deepest condolences to the family members and friends of those who tragically lost their lives on Saturday," the statement said. "We are performing a detailed internal investigation to determine the cause of the accident and the steps we can take in order to prevent future accidents." 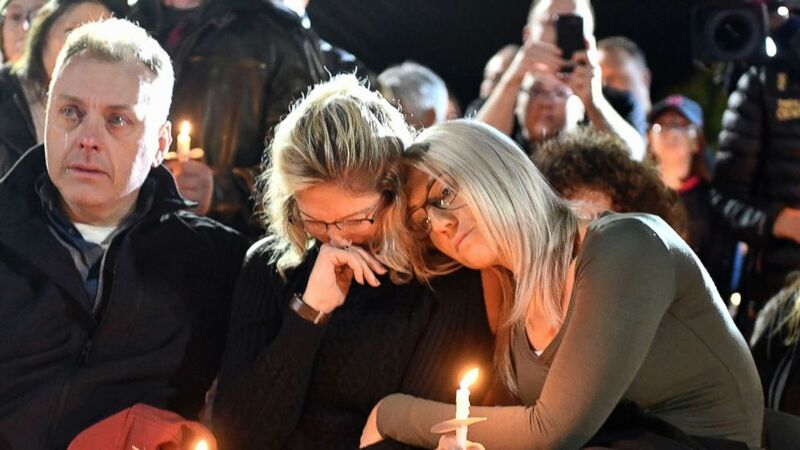 Hundreds of people gathered Monday night at a park overlooking the Mohawk River in Amsterdam, New York, some holding flowers, small candles and handwritten inspirational notes, to honor the 20 crash victims. 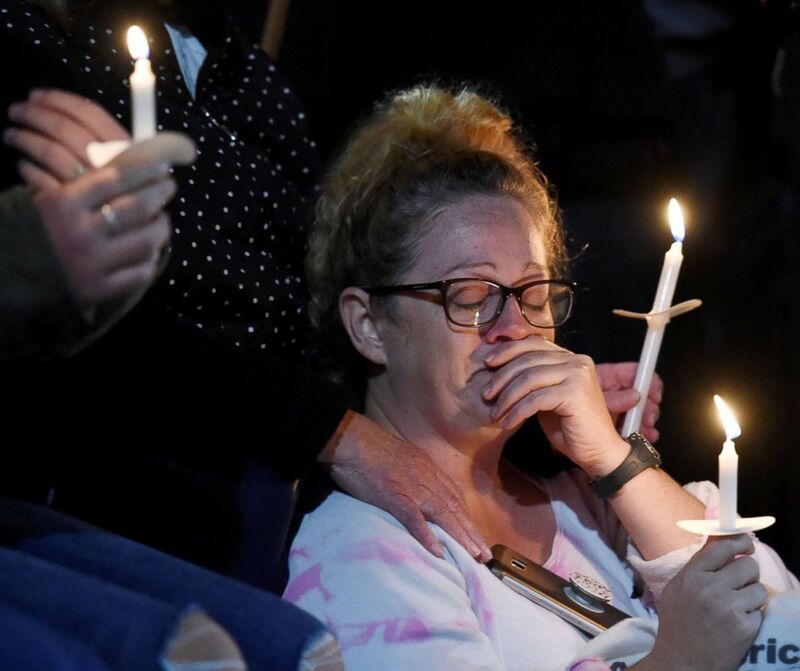 Local leaders, clergy members and residents who knew the victims were among the vigil attendees in Amsterdam, which is the hometown of several victims, community members said. (Cindy Schultz/Reuters) Family members sign a banner in memory of their loved ones during a candlelight vigil for the victims of a limousine accident in upstate New York, in Amsterdam, N.Y., Oct. 8, 2018. “I know that they have become angels in our eyes and in Jesus’s eyes, and I’m just really hurt and saddened, and I just really appreciate my family,” Shannon Hoogkamp, of Amsterdam, told Albany ABC affiliate WTEN. Karina Halse, whose sister Amanda Halse was a limousine passenger who died in the crash, told "Good Morning America" that officials told her the vehicle "was going down the hill at over 60 miles an hour." Newlyweds Erin Vertucci, 34, and Shane McGowan, 30, as well as four young sisters were among the passengers killed, their families told ABC News.